Pulled out an old favorite graphic novel today, a three issue collection called WE3. 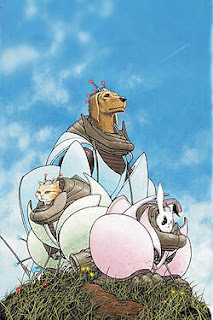 It's written by Grant Morrisson and illustrated by Frank Quitely, a now legendary creative duo in the comic world. They're both Scotsmen, and they've combined to tell some of the most original and beloved stories in the medium. They're known mostly for their superhero work, but this book is different. There are no capes in it. The story concerns the three animals referenced in the title—a dog, a cat, and a rabbit. They are part of a government-run security group. The animals have been cybernetically enhanced. For much of the story, only their heads are visible amid the armor and tangle of technology that covers their bodies. In the opening pages, we see them as they infiltrate a house occupied by some mysterious figure. They make short work of his small army of bodyguards. The creatures have a limited ability to communicate verbally. Their speech is depicted phonetically, in a simulacrum of the kind of words you see as shorthand in text messages or on Twitter. We know as the story progresses though, that at heart these are animals...our pets actually. They would be much happier living that sort of life, instead of the dark servitude they endure as part of a cruel and selfish experiment. Their attempted escape from it can't be far behind. The story is extremely violent and bloody. It's fairly brief as well. I can't help thinking what an excellent film it would make, however. We've become hopelessly inured to violence inflicted on humans, but the suffering of animals, especially those we perceive as our pets, still resonates with us on a visceral level. Perhaps it would be an estimable effort to crack through our hard shells, to make us see that it isn't an abstraction. Our pets are often our better natures, and the suffering in their eyes would bring home the suffering we ignore in our own. I've read that Hollywood has gotten its hands on the story. There doesn't appear to have been much progress with it so far. I hope they give it the care and attention it deserves if or when they do get around to making it. This isn't your run-of-the-mill action flick. This is something more, and in the right hands, it could be a phenomenon. It would be cool to see.